In its Weekly Report On Israeli Human Rights Violations in the Occupied Palestinian Territories for the week of 23 February – 01 March 2017, the Palestinian Center for Human Rights (PCHR) found that Israeli forces continued systematic crimes in the occupied Palestinian territories. 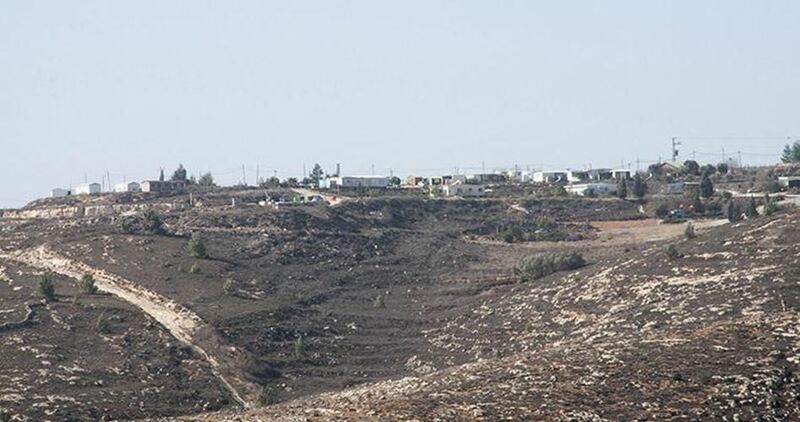 During the past week, a Palestinian civilian was killed by Israeli settlers, south of Hebron. 6 civilians, including 3 children and a young woman, were wounded in the West Bank while a child was wounded in the Gaza Strip. Shortly after the death of Qaisiyah, Israeli forces closed the southern and western side of al-Thaheriyah village and established checkpoints on all the roads leading and linking this village with other villages. They also carried out a wide-scale search campaign under the pretext of searching for a person, who was with Sa’di. An infantry unit surrounded Kherbet Zanouta and al-Khalil Valley area as they prevented the residents from leaving their residential tents. At approximately 19:00, an Israeli force accompanied with 14 military jeeps moved into al-Deir area. They raided and searched the house of Sa’di’s family, detained them and destroyed the house contents. In the meantime, dozens of young men gathered and threw stones at the soldiers, who immediately fired sound bombs and tear gas canisters at them and the houses in response. Half an hour later, the Israeli forces withdrew from the vicinity of Sa’di’s house after they arrested his cousin Amjad Qaisiyah (24). When the infantry unit arrived at the center of the village near the central market, the unit stopped and its soldiers deployed between streets amidst firing sound bombs and tear gas canisters between the shops. They also detained and kicked a number of workers in some restaurants. According to PCHR’s follow-up, a large number of the infantry units deployed in the center of the village after closing the main road with the military vehciles amidst firing sound bombs and tear gas canisters at the civilians and shops. Furthermore, they forced the shops’ owners to close under threat. In the context of targeting Palestinian fishermen in the Gaza Sea, on 26 February 2017, Israeli gunboats stationed offshore, northwest of Beit Lahia in the northern Gaza Strip, heavily opened fire at Palestinian fishing boats and chased them On 27 February 2017. At approximately 12:45 on Friday, 24 February 2017, Palestinian civilians and International activists organized a protest in the center of Kufor Qaddoum village, northeast of Qalqiliya, and then made their way to the eastern entrance of the village in protest against closing that entrance since the beginning of al-Aqsa Intifada with an iron gate. When the protesters approached the entrance, Israeli forces fired rubber-coated metal bullets, tear gas canisters and sound bombs at them. As a result, Mohammed Helmi Jameel Shtaiwi (11) sustained a metal bullet wound to the neck and a 26-year-old man was hit with a metal bullet to the left leg. Following the Friday prayer on 24 February 2017, dozens of Palestinian civilians and Israeli and international human rights defenders organized demonstrations in Bil’in and Nil’in villages, west of Ramallah and al-Nabi Saleh, northwest of the city; at the entrance to al-Jaalzone refugee camp, north of the city; and in Kafer Qadoum village, northeast of Qalqiliyah, protesting against the annexation wall and settlement activities. Israeli forces forcibly dispersed the protests, firing live and metal bullets, tear gas canisters and sound bombs. They also chased the protesters into olive fields and between houses. As a result, many of the protesters suffered tear gas inhalation while others sustained bruises due to being beaten up by the Israeli soldiers. On the same Friday afternoon, the national factions and Defense Committee of Hebron organized a protest titled “Lift up the closure of Hebron…dismantle the Ghetto” on the 23rd anniversary of al-Ibrahimi Mosque Massacre perpetrated by Baruch Goldstein on 25 February 1994 against Muslim worshippers in the abovementioned mosque, killing 29 civilians and wounding 150 others. The soldiers fired live bullets, sound bombs and tear gas canisters at the protestors while they were praying. 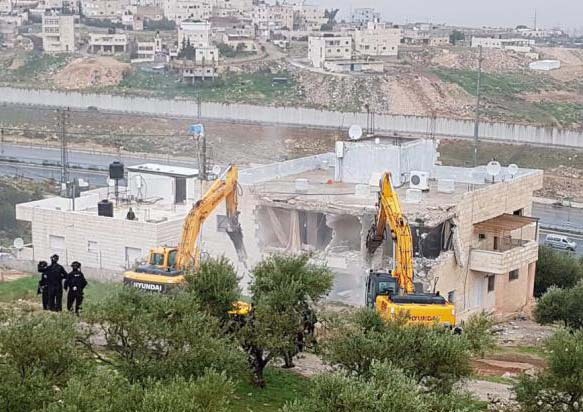 Moreover, a protest moved from Ali al-Bakkaa’ Mosque towards the settlement outpost known as “Beit Romano” established by the Israeli forces on the rubbles of Osama Bin Monqeth School. Dozens of Palestinian civilians and Israeli and International peace activists, raising the Palestinian flags, participated in the protest. Before they approached the area, the soldiers directly fired sound bombs at them. As a result, many civilians sustained tear gas inhalation and were transferred to the hospitals in the city. The soldiers also attacked and beat the activists, so they sustained bruises throughout their bodies, but no arrests were reported. The Israeli forces then announced the area as a closed military zone. The U.S. presidential administration of Donald Trump is reviewing its participation in the top United Nations human rights body, with an eye to reform a balanced agenda that ends the forum’s “obsession with Israel”, a senior U.S. official said on Wednesday, according to Haaretz. 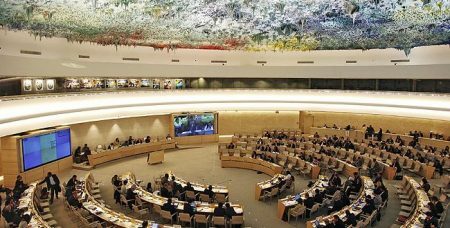 “In order for this Council to have any credibility, let alone success, it must move away from its unbalanced and unproductive positions,” Erin Barclay, U.S. deputy assistant secretary of state, told the UN Human Rights Council. Two days ago. PNN further reports, PA president Mahmoud Abbas gave a speech in front of the council in Geneva, where he called on states to defend a two-state solution for the future of a Palestinian state. Abbas asserted that Israel is moving towards the creation of an apartheid state with the passing of the new Israeli law legalizing dozens of Jewish outposts built on private Palestinian land. In addition, he warned from moving the U.S. embassy from Tel Aviv to Jerusalem. The Palestinian Education Ministry documented Israeli violations against 89,799 Palestinian learners and 5,528 teaching staff members in 2016. According to a Tuesday report by the Palestinian Ministry of Education, 26 Palestinian learners were killed by the Israeli occupation forces while 1,810 others and 101 instructors and employees were left wounded. At the same time, 198 learners and teaching staff members were arrested by the Israeli forces. The report further documented Israeli attacks against 162 Palestinian schools. The attacks were carried out using live ammunition, teargas canisters or/and rubber bullets. As a result several schools have been partially or totally put out of operation. Crackdowns at Israeli-run checkpoints led to the suspension of 4,878 classes. Seven learners enrolled at Jerusalem schools, along with a staff member, were, meanwhile, subjected to house confinement. 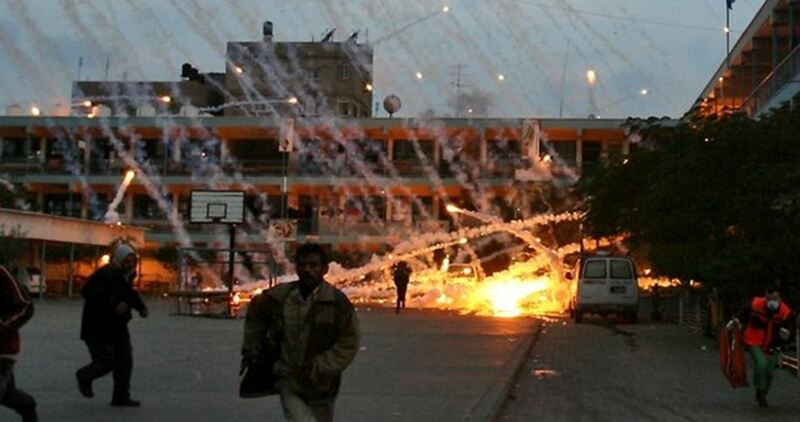 60 schools had also been subjected to aggressive assaults by the Israeli army using teargas grenades and bullet fire. Cases of heavy beating against schoolchildren and tutors had also been recorded during those attacks. Nine demolition or stop construction orders were also handed out to a number of Palestinian schools across the occupied territories. The Education Ministry appealed to all human rights institutions to take urgent action vis-à-vis such Israeli aggressions and to expose Israel’s incessant violations of international law and of Palestinians’ right to free and safe education. A report titled “Land Takeover Practices Employed by Israel in the West Bank” and published by Yesh Din unearths some of the methods used by various Israeli bodies to take over land in the occupied West Bank. A survey of the proceedings in which Yesh Din represented Palestinian residents of the West Bank before the courts and various Civil Administration committees provides an overall picture of the practices and maneuvers the Israeli authorities use in order to increase the reservoir of land meant to serve Israeli interests in the West Bank. According to Yesh Din, International law prohibits the exploitation of the occupied territory to serve the needs of the occupier. Therefore, increasing the amount of land Israel builds on requires either legal acrobatics designed to create the appearance of the rule of law, or brazen defiance of the law while law enforcement authorities turn a blind eye. “The legal proceedings led by Yesh Din, and others, have challenged the state, especially with respect to unauthorized outposts in the OPT. These proceedings have forced Israel to expose its policy regarding the issue,” the report read. “One example is that after many years of claiming that any illegal construction must be removed, regardless of the status of the land, more recently, Israel’s official position has been that illegal construction on privately owned Palestinian land must be removed, but, any illegal construction on public land would be retroactively authorized,” it added. Yesh Din NGO also noted that in order to implement this new policy, all authorities and Civil Administration bodies have been mobilized to favor offenders and find administrative and procedural solutions that would allow to retroactively authorize structures or communities, instead of fulfilling their duty to enforce the law and protect the property of the local population in the occupied territory, as required under international law and according to the rulings of Israel’s High Court of Justice. Yesh Din – Volunteers for Human Rights – is an Israeli organization registered as a non-profit in Israel. Yesh Din is subject to Israeli law and is served by a volunteer corps and by a professional staff. Yesh Din views the occupation as a main source of the violation of the human rights of the Palestinian population and therefore seeks to end it. At the core of Yesh Din’s work is collecting and disseminating reliable and updated information regarding systematic human rights violations in the OPT; conducting public and legal advocacy in order to pressure Israel’s authorities to cease violations; and raising public awareness to human rights violations in the OPT. 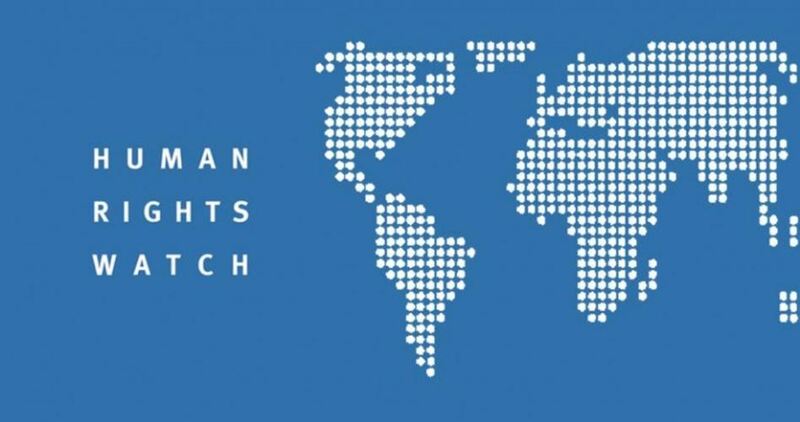 21 Human rights groups have strongly condemned in a joined statement issued Friday the Israel’s ban on Human Rights Watch (HRW) entry into the occupied Palestinian territories. We, human rights organizations from Israel, consider Israel’s refusal to allow Omar Shakir of Human Rights Watch (HRW) to enter the country a cause of grave concern. We stand in solidarity with him and our colleagues at HRW, the statement said. Israel seeks to portray itself as a card-carrying member of the club of democratic countries. Yet what is democracy without free speech, robust public debate and open criticism? A state that defines itself as democratic cannot turn its border control into a thought police, according to the statement. Neither closing Israel’s borders to human rights organizations and activists nor other measures by the Israeli government against organizations that criticize the occupation will deter us from continuing to report human rights violations in the territories controlled by Israel. Attempts to silence the messenger will not suppress our message, the statement included. The 21 human rights groups include Adalah Center, Akevot, Amnesty International Israel, Bimkom, Breaking the Silence, B’Tselem, Coalition of Women for Peace, Emek Shaveh, Gisha, Hamoked: Center for the Defense of the Individual, Haqel-Jews and Arabs in Defense of Human Rights, Human Rights Defenders Fund, Machsom Watch, Negev Coexistence Forum for Civil Equality, Physicians for Human Rights Israel, the Public Committee Against Torture in Israel, and Yesh Din.